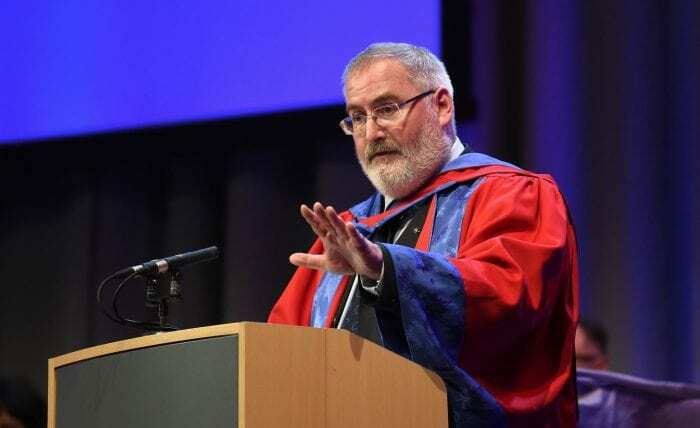 Graduates should turn to art to help them through life’s rough times, according to Chris Riddell OBE, illustrator and former Children’s Laureate. He told University of Brighton graduates at their awards ceremony: “Life is sometimes hard. Things go wrong, in life and in love and in business and in friendship and in health and in all the other ways that’s life can go wrong. Riddell was speaking after receiving an Honorary Doctor of Arts degree from the University in recognition of his major contribution to children’s literature and encouraging visual literacy. The award was presented on Friday (8 February) when more than 2,000 University students graduated with many in attendance at ceremonies at the Brighton Centre. Riddell, who lives in Brighton, borrowed quotes from his author friend Neil Gaiman: “Remember that whatever discipline you are in, whether you are a musician, photographer, a fine artist, cartoonist, writer, dancer, designer, whatever you do – you have one thing that’s unique. You have the ability to make art. “And for me, and so many people I have known, that’s been a lifesaver. The ultimate lifesaver. It gets you through good times and it gets you through the other ones. “Husband runs off with a politician? Make good art. Leg crushed and then eaten by a mutated boa constrictor? Make good art. Inland Revenue on your trail? Make good art. Somebody on the internet thinks what you do is stupid or evil or it’s all been done before? Make good art. Sam Davies, the University’s Director of Philanthropy and Alumni Engagement, introduced Riddell who graduated from the University in graphic design in 1984 and won the University’s Alumnus Award in 2013. In 2015, Riddell became the UK’s ninth Children’s Laureate and championed creativity and the importance of visual literacy, encouraging everyone to enjoy the “joy of doodling” by drawing every day. Riddell was awarded an OBE in this year’s New Year for services to illustration and charity. This entry was posted in Alumni, Design and craft, Fine Art, Graphics and illustration, Media and tagged Chris Riddell.